An 1839 poster urges citizens to rally against the coming of the railroad to Philadelphia. As the poster suggests, industrial technology and "progress" have not always been greeted with universal acclaim. The anonymous author(s) of this broadside warn of the danger to life and limb posed by the new technology (in fact a number of disasters did befall the early locomotives) and claim it will have a deleterious effect on the city's trade, the beauty of its streets, and the status of its artisans and tradesmen. 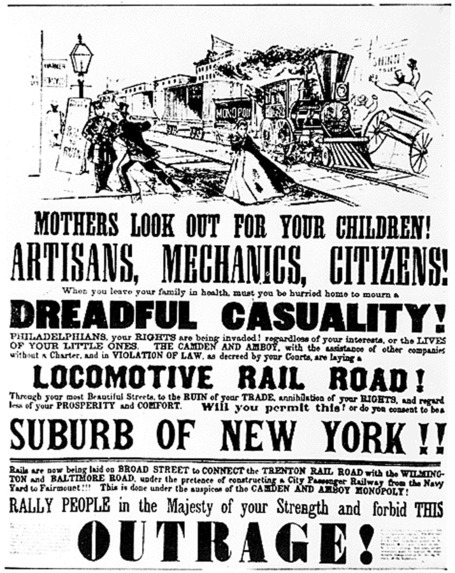 Worst of all is the threat to the status of the city itself: the railroad, the poster claims, will turn Philadelphia into a mere "suburb of New York!!" Source | Department of Commerce Bureau of Public Roads, Poster circulated in Philadelphia in 1839 to discourage the coming of the railroad, 1839, National Archives, http://arcweb.archives.gov/arc/action/ExternalIdSearch?id=513347. Cite This document | Department of Commerce Bureau of Public Roads, “"A Philadelphia Poster Protests the Coming of the Railroad",” HERB: Resources for Teachers, accessed April 23, 2019, https://herb.ashp.cuny.edu/items/show/1175.